Josh Horowitz from MTV News just posted the news online that Daniel Radcliffe has joined social media, but not with Facebook or Twitter. Some of you (well I did) may have noticed the verified Google+ account already some weeks ago. "This has mainly come about because of the amount of people that I meet who tell me that they have contacted me on Twitter or Facebook when I know that's impossible — because I don't belong to either one of those sites," Radcliffe told MTV News about joining Google+. "Now that I have this page, there will be an outlet for accurate information and hopefully people will not waste their time giving credence to people pretending to be me." 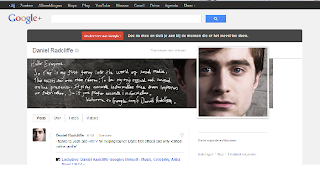 So, Radcliffe hopes his frequently-updated Google+ page will keep imposters out and the facts straight regarding his professional life. "It will be active," he said, "but with updates about things I'm working on or have worked on, including things I'm passionate about, like The Trevor Project. What it won't be is the minutia of my daily life, like what's on the craft services table." So while Radcliffe's Google+ won't let you know whether or not he picked macaroni and cheese for lunch on the "Horns" set, it will still provide insight into his craft and career goals. But with more and more inside details on one of today's hottest actors readying their way onto the web, it would be completely understandable if Radcliffe is feeling some trepidation over his official online debut. "Trepidation sums it up very well," he agreed. "It's a sense of not knowing what to expect, as opposed to any actual worries." Unseen photos etc. will also be shared on this site. Check the label Google+.